View About ETF the NSCC ETF service. ETF Processing explains the PCF creation/submission process. ETF Portfolio Portal and ETF Historical provide detailed walkthroughs of tasks performed using the ETF Portfolio Service Web Interface. View Trade Relationship Management (TRM) to learn more about accessing the sytem, using the dashboard, creating new trading relationships, and other useful tasks. Access NSCC File Formats for ETF, ETF Guides, historical portfolio compositon file (PCF), historical MRO file specifications, important notices, and sample reports from ETF Documentation. View ETF Working Group meeting notes and related content. Log in to view Exchange Traded Fund (ETF) content in this Learning Center. An Exchange Traded Fund (ETF) is a portfolio of securities that trades on an exchange as an equity that seeks to replicate the performance of an index without the need to purchase the underlying components. The NSCC process for clearing ETFs includes the ability to review, either on-line or in a data file, the ETF portfolio constituents, thus automating the creation and redemption of ETF shares and their subsequent settlement. The ETF processing service includes a web based tool displaying the ETF portfolio constituents and relevant cash amounts. ETF processing also includes a nightly distribution of domestic, foreign, and fixed income portfolio information. Learn more about the ETF processing by expanding the About ETF sections below. Use the menu items at left to access training materials, video FAQs, ETF Portfolio Compostion File information, and ETF documentation. To view ETF learning content, log in to the Learning Center. NSCC's ETF process automates the creation and redemption of ETFs when the underlying securities are eligible to be cleared through NSCC. NSCC reports, clears and settles ETFs and their underlying securities through its creation/redemption process. NSCC’s ETF processing service includes a web based tool displaying the ETF’s portfolio constituents and relevant cash amounts. The browser based application data can be down loaded by Members as an excel spreadsheet. Members may also elect to receive a data file of the same portfolio information. In the event the securities underlying an ETF are not NSCC-eligible, NSCC’s ETF processing service allows Members to customize standard portfolios by excluding those securities and substituting those securities with cash or with another NSCC eligible security. The customized portfolios can then be used to create and redeem the ETF within NSCC’s ETF processing. The Depository Trust Clearing Corporation has worked diligently over the past 20+ years to innovate and modernize its range of ETF products and services. On January 22, 1993, DTCC cleared and settled the first trades placed on ETFs. Fast-forward nearly 25 years later, the ETF industry has matured both in terms of product availability and assets under management with the latter continuing to demonstrate rapid growth year over year. Even as the universe of exchange-traded products expands and becomes ever more complex, central counterparty (CCP) clearing of ETFs continues to offer the same essential benefits it provided in 1993; most critically, centralization, standardization, risk reduction, and operational efficiency. To view the complete white paper, see the The Evolution of ETF Clearing: Opportunities Ahead. Enables broker/dealers and others to bid and offer shares in the secondary market. Enables shares to trade on an exchange at prices other than the net asset value (NAV). Enables ETF shares to be redeemed at the NAV in creation units only. NSCC's ETF process automates the creation and redemption of ETF securities. NSCC reports, clears, and settles ETFs and their underlying securities through its creation/redemption process. ETF processing also includes a nightly distribution of domestic, foreign, and fixed income portfolio information. 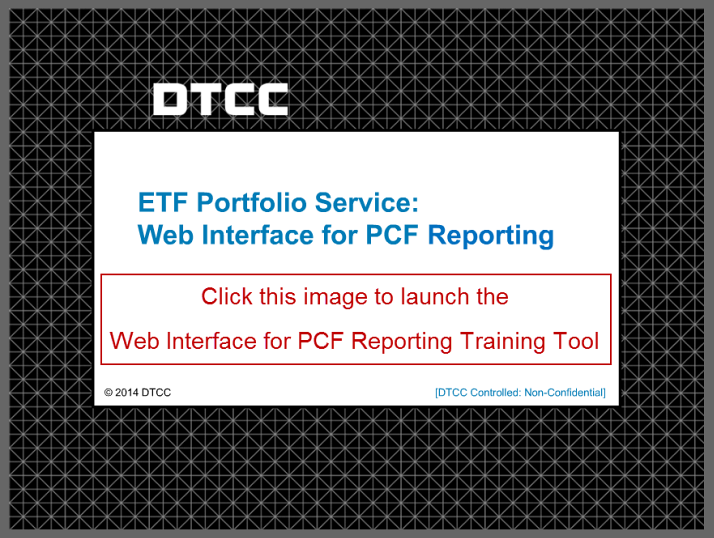 All relevant ETF formats are available at: http://dtcc.com/clearing-services/equities-clearing-services/user-documentation/client-center-formats/file-formats.aspx. NSCC allows participants to customize portfolios by excluding specific securities and replacing them with cash. NSCC can support ETF processing when the underlying security is not eligible at NSCC (for ETFs that have been created and redeemed against cash, in lieu of securities). NSCC also clears and settles ETFs traded in the domestic secondary market. 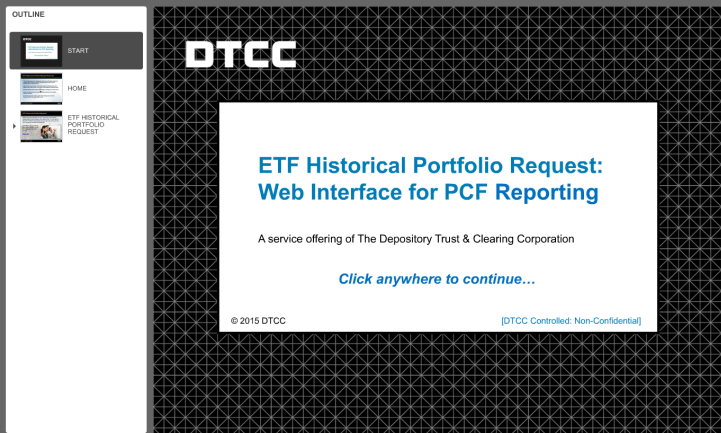 This 19-minute video provides an overview of the DTCC ETF Portfolio Composition File and ETF Historical data products. Any full service NSCC Member that has entered into an Authorized Participant agreement with an ETF Agent and Distributor/Sponsor to become an Authorized Participant can use NSCC’s ETF processing service. The fund manager or the issuer sends a portfolio listing file (PLF) to the index receipt agent. The portfolio composition file displays the individual securities and the weightings that make up one ETF basket for the following trade day. For most ETFs one basket equals 50,000 shares. The portfolio composition file also includes cash amounts in the fund for each basket unit, such as accrued and balancing amount. The index receipt agent sends a portfolio composition report/file listing the securities in each ETF to authorized participants. The file also contains the estimated cash amount in each portfolio. Transactions eligible for cash creates and redeems show a cash creation amount on the portfolio composition file. Places a creation/redemption order through the distributor. Sends the creation/redemption order to the index receipt agent and a confirmation to the fund manager or issuer. After receiving the order from the distributor, the index receipt agent sends NSCC ETF creation instructions on behalf of its authorized participant. You can also download print image versions via the DTCC Portal GUI. On the night of T, NSCC sends an instruction detail file showing the details of the creates and redeems to participants with activity. The report serves as the contract for the creation/redemption activity. NSCC assigns the closing price on T to each of the components to determine their contract value. NSCC then totals the contract values of all of the components and assigns that amount as the contract value. There is also a cash amount that pertains to accumulated dividends, fund fees, and any balancing amount that is applied to the value of the ETF's contractual value. The cash amount is reflected in the consolidated settlement system. The cash amount also contains a transaction fee that is collected on behalf of the agent, but is not guaranteed by NSCC. Note: Starting in 2012, the cash amount contains only the transaction fee. NSCC distributes Consolidated Trade Summary Reports. NSCC distributes CNS Projection Report. NSCC distributes Non-CNS Consolidated Trade Summary Report for ineligible securities. Delivers the underlying components to CNS. CNS delivers underlying components to the index receipt agent. Delivers the 50,000 ETF shares to CNS. CNS delivers the ETF to the authorized participants. Deliveries are made through DTC book entry with CNS. To contact DTCC's customer service center: 1-888-382-2721. The table below provides details about the types of ETFs in existence as of this writing. Attempts to replicate the performance of a market index, for example, the S&P 500. Daily leveraged or inverse ETFs. Use replication, representative sampling, aggressive sampling. Invests in commodities (precious metals, futures). Not regulated as investment companies under ICA of 1940, but subject to CFTC regulation. Public offering subject to SEC review, and no-action letter needed. Most popular are gold and silver. Invest in U.S. government, corporate, or municipal bonds (for example, iShares Barclays 20+ year treasury bond fund). Rydex Investments launched first fund in 2005 known as "Currency Shares." First launched in 2008 by Power Shares. Reorganizations – both mandatory and voluntary are processed at NSCC. The typical corporate action on ETFs is a regular or reverse stock split. A new CUSIP is usually assigned to the ETF but the trading symbol does not change. Components can also undergo a corporate action such as a regular or reverse split, cash dividend, spin-off or liquidation. For information about products and services related to Exchange Traded Funds, visit the Universal Trade Capture (UTC) section of this Learning Center. Watch this 3-minute video for an overview of the ETF Lifecycle. In this short video, Hank discusses what DTCC has planned in the ETF market for 2015. In this short video, Hank provides a brief explanation of Data Sales at DTCC. In this short video, Hank explains that Portfolio Composition Files are available to Non-Participants. In this short video, Hank talks about what appears on the output when creating/redeeming ETFs. In this short video, Hank Belusa answers the question, "What information does the ETF Portfolio file provide?" In this short video, Hank answers the question, "What is NSCC's role in processing ETFs?" In this short video, Hank answers the question, "How many types of ETFs are there?" In this short video, Hank answers the question, "How are ETFs regulated?" In this short video, Hank answers the question, "What is an ETF?" View a list of frequently asked questions about Exchange Traded Funds (ETFs). You can also access and print the PDF version of the pdf ETF FAQs & Expanded ETF File Format Definitions (338 KB) . Login to view all of the frequently asked questions. Who Do I Call For Information About NSCC's ETF Process? For more information regarding NSCC’s ETF process, contact Relationship Management at 800-422-0582 or the Customer Support Center Hotline at 888-382-2721. What Information Is On The Files? Additional file details are available in documents available on dtcc.com – follow the link below and click on "ETF" (you may need to scroll down) to reveal/access them. Are Sample Test Files Available for the Enhanced ETF Output File? How Are Cash Amounts Calculated? All the cash amounts are submitted to NSCC by the ETF Agents and NSCC redistributes the information to its subscribers. We cannot validate the Issuer, Sponsor or the Agents calculation. However, Key Definitions beyond what is available in our file formats is included in this document. Should you need additional information as to a particular calculation please contact the ETF Agent or Issuer for that particular ETF. What Does A Header Record Zero Signify For An ETF Fund? When NSCC does not receive a component based PCF from the Index Receipt Agent, we use the previous day's PCF and zero out the fund values. All the porfolio header records are zero. The only portfolio header records that are not zero are the CUSIP number and number of components. For Domestic portfolios, this alerts subscribers that the previous business days file will be used should any creation or redemptions occur for the particular ETF.